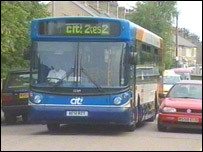 The Conservatives say they would let car drivers use bus lanes as long as they are carrying adult passengers. The party wants to allow vehicles to use the lanes if they contain up to two adults, but children would not be included in the scheme. It is one of a number of proposed measures which the Conservatives say will help drivers deal with everyday traffic irritations. They also promise to force councils to get the full approval of the emergency services before they install road humps. The Conservatives also say traffic wardens should not have powers to punish drivers for motoring offences. Sunderland council has already opened up bus lanes to taxis, lorries and cyclists as part of a trial system. But Conservative Councillor Lee Martin says the scheme should be extended to car-sharing on the A690 Durham Road. If approved, the bus lanes on the road would be opened up to motorists who share their cars with others. Mr Martin said: "There are a lot of people that use the A690 in and out of work and it tends to be drivers on their own. "Car-sharing has been trialled by councils such as Leeds and they use cameras to check up on drivers." But the AA has expressed doubt about enforcing the use of such lanes. Labour transport minister Kim Howells said: "There is nothing new in any of this. Many of the measures suggested are already being implemented or have been ruled out at a local level as unworkable. "Indeed, some of these proposals would make congestion worse. "We will be bringing forward new proposals to improve road safety in a Bill as soon as possible and we have recently legislated to tackle congestion through the Traffic Management Bill."